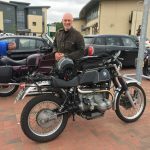 This last weekend blasted past with an intoxicating mix of passion, history, two wheels, presentations, tech sessions, practical servicing sessions (with Ian Brocklebank, Mike Fishwick, and Bob Porecha), trade stands (including the guys from Motorworks) and book signings. The latter by the amazing Ted Simon (in his mid-80s and still going for it! ), Elspeth Beard (what a story!) and yours truly. There was even a motorcycle artist there and wow what talent Talana Gamah has! 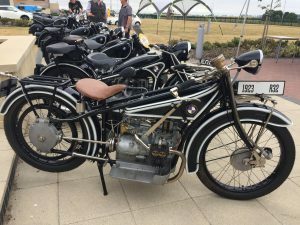 I was amazed by the things that people had done with their Airhead BMWs, and the range of bikes on show was unexpected, by me at least. If you can think of an Airhead BMW model, then you were more than likely to find it at this event. To me they are practical works of art. If only those sets of wheels, most of which had many miles under them, could talk. Some of the ‘newer’ models had been ridden around the world. And some had travelled to this event from Ireland, Sweden, Norway, Denmark, Holland and Belgium. The rest from the far flung corners of the UK, and a few locals of course. I’m not sure but I think I heard an American accent in the mix at one stage. And one of the presenters, Frank Cachia, had travelled in from Australia. His photos of the various bikes he’s had over the years were superb to see. The Birdswell Track on an R90S? Why not! John May, volunteered to present at the last minute when Hans Muth became injured and had to drop out. John’s presentation title was something like Creating Specials – 30 years of not making Airheads better. Superb. He talked about the Airhead specials he’s made over the years and how they have been well and truly used. Touring, trail riding, overlanding, sidecar outfits and so on. Most of the mods to the bikes people rode in on (very few were trailered) seemed to be hand-made modified with lathes, grinders and welding outfits that are tucked away in personal workshops. 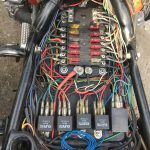 I suspected that more than a few mods had been thought of with the mind enhancing aid of a few pints, and handy fag packets. The results were brilliant to see. Bikes either seemed to gleam, or hold that patina a score years (plus) of being well and truly used can give. There were also some very tasty Airhead trail bikes! I don’t know much about them but words of respect were being spoken about the mods made. With not even a hint of one-upmanship or snobbery, conversations sparked up between friends about to be made. I really enjoyed being around the passion that the people at this event, organisers and attendees created between them. 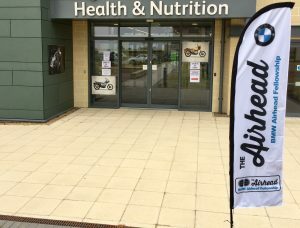 This was ‘The Airhead Event – The largest gathering of Vintage and Classic BMW Airheads ever held in the UK’. Excellent. Held in the Health and Nutrition Hall. Perfect. All you need to survive in life. Airheads – the perfect nutrition for the brain and body. Of course I am biased!